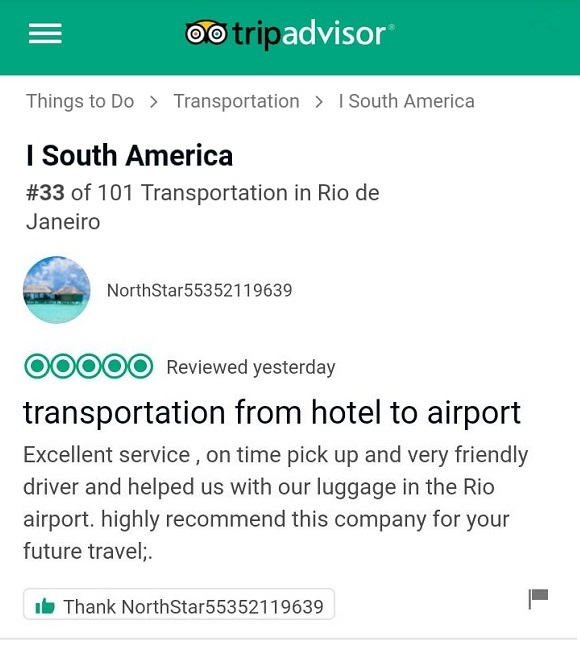 (By ISOUTHAMERICA Staff) - Many thanks to our customers for choosing our services for their transfer needs in Rio de Janeiro, Brazil and for the fantastic review on TripAdvisor! Airport Transfers in Rio de Janeiro. Latest review of ISOUTHAMERICA service on TripAdvisor: "Excellent service , on time pick up and very friendly driver and helped us with our luggage in the Rio airport. highly recommend this company for your future travel." By NorthStar55352119639 user. Read more reviews here.